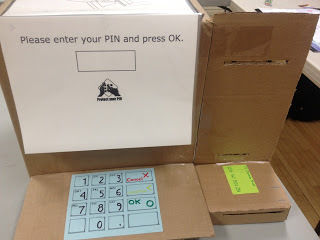 Check out my blog post in which I tell about the time I built a classroom ATM from a cardboard box and how you can do the same using mock ups of TD Green Machine screens I have already created. For CLB 4 and up, I created a matching activity from an informational pamphlet from TD Bank. Print one copy on green card stock, one copy on yellow card stock. Keep the left column in green (discarding the right column) and cut the squares apart; keep the right column in yellow (discarding the left) and cut the squares. Now you have a set you can distribute, one card per student or partnership. A fantastic resource is English for Financial Literacy, which you can download for free from the Settlement at Work Wiki. When I recently taught a banking module for my multi-level seniors class, I introduced learners to actual TD Bank schedules of fees and interest rates for all savings and chequing accounts. You are free to edit this reading assessment and the rubric that I designed as an end-of-week test of their abilities. GFC Learn Free has an ATM simulator (American). Here is a Canadian ATM simulator. Here is a debit / Interac (TM) simulator. Is there even a need to teach this topic anymore? Well, if there is, help yourself to these worksheets. I used this text on identity theft and the attached activities for a multi-level seniors class, most of them at CLB 3 or higher.